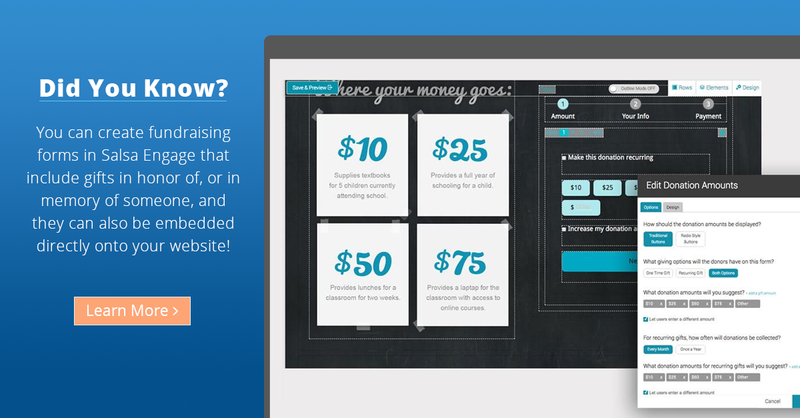 A donation page allows your supporters to contribute money to your organization. It will collect their personal information and credit card number, then submit the transaction to your merchant gateway processor. Salsa will then display a thank you or redirect page to your supporter, and record the status and details of the transaction in a donation record. Reference Name is entirely an internal name, invisible to the public. Use organized, specific titles such as 2015 January - Breakfast Taco Fund Pageto make sorting and locating easier. Header text and information appears at the top of the finished donation page the supporter will see, above the donation form itself. Use the WYSIWYG editor to edit text and insert/upload images, or click the Source button and paste in HTML code directly. Footer text and information appears below the donation form, and is generally used for either additional information about the page or identity information about your organization (for example, this might be where you put your tax-exempt status). Salsa automatically requires First Name, Last Name, Email Address, and Address information because these fields are necessary to process a credit card transaction. You can add more fields, including custom fields, by clicking Add a new field and selecting the new field from the drop-down menu. You can make any field required by clicking the "required" check box next to it. Remove fields by clicking the button with the minus symbol to the right of the field name. To change the order of the fields, Click the Use Field Order Shown Below box, then change the order of your saved fields by click the drag handle next to any field, and holding down your mouse button as you move it up or down the field list. Enter amounts in Comma delimited Amounts like 5,10,20,50,100. Don't use spaces or dollar/currency symbols. All Salsa donation pages will always provide an Other (fill in the blank) option for donors. Select Include Recurring Payments to add recurring options to your page. Make sure your Merchant Gateway allows Recurring Payments before using this option. Selecting Include Only Recurring Payments will remove the option of one-time donations on this particular donation page. The Include Payments By Check (a.k.a. Electronic Funds Transfer/EFT) option is only available with the PayflowPro gateway. Selecting this box will enable a supporter to donate directly with their bank account. Contact support if you want this option enabled on your account. Use the Merchant Gateway section to select the specific gateway you want to use, this is only applicable if you have more than one on your account. In the Assign Email Autoresponses section you can choose what type of automated message a donor receives after donating. See the guides on Autoresponses/Email Triggers and Streaming Emails for further information. Enter content in theThank You Page Text section if you wish to display a simple thank you message after a donation. If you want to send a donor to an entirely different page after donating leave the Thank You Page Text blank and enter a URL in the Redirect field. Make sure to include http:// or https:// in your redirect URL to ensure it redirects correctly. The Optional Text tab of the Donation workflow allows you to personalize and customize the content on your donation page. This is an optional step and can be skipped entirely, if you prefer. Text and content entered in the Pre Donation Text will appear directly above your donation amounts. Text and content entered in thePre Custom Text will appear directly above any custom fields added to the page. Leave blank if not using custom fields. The Custom Donation HTML section is used to add elements to your page to give it a unique look and feel. You should only use it as directed by Salsa Support or your organization's current practice. Please note: any code entered in this section will override both the amounts entered in the Comma Delimited Amounts section and the Pre Donation Text section. You'll want to make sure that you've moved any code/text from Comma Delimited Amounts and Pre Donation Text into your Custom Donation HTML. When using Custom Donation HTML, it is always important to test your page before you publicize the link in an email blast or on a webpage. For more information testing a donation page, read here. Adding content to the Confirm Box Text section will add a checkbox to your donation page. Donors will not be allowed to submit their donation without clicking the check box next to this text. Adding content to the Pre Submit Footer will add content above the Submit button. Use the Number of Columns option to select between a single or double column page. Use the Minimum Donaton Allowed section to set a minimum amount. Must be at least $2 or above. Use the Maximum Donation Allowed section to set a max amount, if left blank the amount will be set to $25,000. Use the Default Tracking Code section to assign a specific Tracking_Code to all donations that come in from this page. Checking the Include In-Honor-Of Donation option will add three fields to your donation page to collect In-Honor-Of information. Checking the Include Designation Code option will add a fill in the blank box to the page, it saves to the Designation_Code field. Checking the Include In-Memory-of Donation option will add one field to your donation page to collect In-Memory-Of information. Checking the Disable option will deactivate the page. If you have a redirect set in the Follow-up section the page will redirect to that page. If not, the page will load with the message "This page is no longer available." -- this is uneditable so we recommend setting a redirect. Use the Tax Status to set a specific Tax_Status for all donations that come in through the page. Previewing and publishing is the same for all Salsa pages. Review these instructions for a quick How To. where is the documentation directing one to possible tax status values and how they are automatically recorded with a persons online credit card donation (we use paypal pro flow). Again, how is tax status assigned into a persons donation record. That's taken care of in Step 7 - Options. You'll see it just above the comment section here under Tax Status. Is there a plan to add 501c6 as a tax status? If not, can I do that manually? We'll be sure to update that thread when the change has been made. "For more information testing a donation page, read here." Where do I go to learn how to test donation pages? I'd like to collect the donor's information AFTER they read their options for donating. Is this possible? My custom HTML has a long list of benefits for each option of support and its a long way back to the fields at the top, and then down again to fill out the credit card information! If you're looking to re-arrange the fields as they're laid out on your page right now, I would recommend emailing Support@salsalabs.com to get some specific advice for your page layout. Where would you direct people do if they set up a recurring gifts and they decide they want to edit their recurring gift information. Can they log in to do this themselves? Great question. Once a recurring donation is submitted, from that point on the merchant gateway itself handles all aspects of the subsequent donations. In other words, any edits to their recurring gift information must be submitted and managed through the merchant gateway itself, not Salsa. Why doesn't the Thank You page include the donor's donation information? I thought it used to, but it's not showing for us anymore. Can the option for recurring donations be limited to just every year? We would like to use the donation page for a fee for service purpose. That means that the "other amount" option is not an option really. Is there a way to code this out? I can't seem to find an option to do so. Hey Libero! Sorry this took a while to respond to, but you can see how to get rid of that field in our Salsa Solutions section here. Thanks so much! Could I get help with the HTML to add an "other" option to my list of custom amounts? Thank you! Is there a way to center or insert the donation amounts and user info into a table that then might be centered? Is there a way to copy an existing donation form (one that we are currently still using and want to continue to use)? I need to create a new donation form and prefer not to start from scratch.